How do you know you're not just making karma worse?? The answer to the question in the OP is given in the first two verses of the Dharmapada. But dependent origination, when reduced to its essential components, simply means: where there is affliction, there is a cause for action; where there is action there is a cause for suffering; and where there is suffering, there is a condition for further affliction. Without affliction, there is no cause for action; without action, there is no result, suffering. A Buddhas deeds are not based on afflcition (desire, hatred, and ignorance); they are based on wisdom. Hence, they do not result in suffering. A buddha's mind stream is conditioned and relative; it is however free of affliction and endowed with omniscience. Dzogchen mainly describes how samsara begins (with an aim to reverse it), but the “mechanics” of samsara are the same: affliction—> action —> suffering —>affliction as infinitum unless one breaks the chain at affliction. An action always has a result. An affliction does not need to have a result. What is the definition (in the context of Dharma) of an affliction? What is the definition (in the context for Dharma) of an action? Per the mechanism illustrated in the sequence above, WHY is it that affliction does not need to have a result? A painful mental state, i.e., desire, hatred, and ignorance, or anything that is conducive to a painful mental state, i.e., impure conditioned phenomena. Volition is action, this produces verbal and physical acts. Afflictions do not necessarily produce volitions. When we are aware of our afflictive state, we can disengage our minds from actions related towards afflictive objects. This is why we practice śamatha, actually, so that we are aware of our mind's afflictive state. Being aware of our mind's afflictive state is called mindfulness and attention. Being unaware of our mind's afflictive stated is called being mindless and inattentive. What we are today comes from our thoughts of yesterday, and our present thoughts build the life of tomorrow: our life is the creation of our mind. If one speaks or acts with an impure mind, suffering follows as the wheel of the cart follows the beast that draws the cart. If a person speaks or acts with a pure mind, joy follows as her own shadow. I think this is where faith enters the picture, is it not? "How can I be sure I'm acting from pure motives?" The answer is: you can only do your best. That's where trust of your true nature and in the dharma comes into play. We can't understand all the depths and complexities in our current state, hence, the need for the teaching in the first place! That is why it is compared to a raft. And we need to have faith in it. What are the post signs along the road I should be paying attention to? Good intention is so important but perhaps not enough and sometimes even triggering. Even someone wishes so very much to help, the help can be seen as an attack. Just like a wolf painfully entangled in a trap, will bite when a hand is sticking out to help him out of that desperate situation. He would bite, as we would, to each other and perhaps even to Enlightened help. Trapped in duality, I think your advice is a great recommendation to be less a slave of the dividing mind. As long as dualism is present, there is continuation of karma. That's why the relation to the teacher is so important. Because you need that faith until you see for yourself. I am fully accepting that I don't see into the functionalities of cause and condition. The more I practise the more firm beliefs transform into mere possibilities. We talk about karma in principle, and I am fixed (determined) on understanding it in its correct view. But not to just understand and talk about it. I want this to be done already. I'm fed up with being ignorant. It is very clear to me once I entered this practice how incredibly multifaceted every relative situation is even in ONE family for each individual.. and grasping just how many conditions contribute to stimulate habituated patterns that manifest like from "many a fiction story for every episode of one's life," yet seeing them line up, tracking the trends, hindsight helps in defining and illustrating very clearly what is priority and what isn't... I fully trust the self-perfecting process precisely because the connection proves I prioritized my connection to the teachings before, in this being inhabited by a conventional me, and wh knows how many other Me's before. It sometimes feel like the anchor was to be born where my teacher was in the years he was there (not many Tibetans in Naples) but I had a specific situation which was quite awful for many years. It was slaking off debts one by one to get to a position where the practice can really begin, one insanity after the other and many of those afflictions did exhaust themselves and no longer bind my current conditions... But some DO! Yet somehow I'm not that attached to their story anymore, I see them for their worth and only feel a kind of gratitude my conditions provided me with the correct medicine to feel the transparency of things... As if becoming more relative in my understanding in which even more precision is called for! Ogyen, you haven't responded to a question on the first page: which vehicle does your post refer to? I read so much pondering in the long posts you write. I see your longing for logic, precision which you think to attain through determination. And I think (and that is the dzogchen view) that this is not how it is going to work. Let go and rest in what is there right now. Now remembering, no expectation. Make the seeing of the true nature of your mind your one and only goal. Trying to verify your karma is just another play of the ego's mind. Of course it may be fun going down that road, but stay in awareness of its inherent emptiness. This is where the true journey starts. Karma is a difficult one to figure out. For example: My brother died earlier this year and left a heap of debts that my family and I have to pay for. This lead me to wondering: How can I know if this is due to old debts which were accrued by me towards him that I now have to pay for, OR are these new debts being accrued by him towards me? Only a Buddha can know. Sorry to hear about your brother, Grigoris. Your post got me thinking about collective karma though. What role does it play, if any, in a situation like this? Is that even how collective karma works? How much of our suffering is due to our own karmic debts? At what point can we say that suffering is not just the result of individual karmic debts? Is it when an entire country is devastated by some natural disaster or when an entire group of people is persecuted and killed? Does collective karma operate on a smaller scale - like between a group of co-workers or a family unit? I understand that there is a danger with this line of thinking, especially for someone like me, where collective karma can be a means to externalising all of my suffering and causes of suffering. But can this be notion be totally ignored when looking at suffering in its entirety? I'm probably not articulating this well due to incompetence. Apologies for the noob post. At what point can we say that suffering is not just the result of individual karmic debts? This is a very interesting question, which is going beyond my poor limitations. Instead of being able to provide an answer, other questions are popping up only: if all karmic debts would be purely individual, would there than not be a subtle belief in an "individual, a person, a one on itself"? Is not all dependent, even so subtle what our intellect cannot get? I do not reject when we are acting unwholesome or wholesome, from these, our own harvest will be coloured. Would that only be, without any influence on all around us? Then how would it be called wholesome and unwholesome? Personal only? I do not reject we must awaken ourselves, none can do it for us, (even we are temporary dependent on 'some navigation medicines' to help) But if it is solely individual ' karmic harvest', we must be energies on our own. Perhaps with a stony separating wall around body-speech and mind. ps My warm support to Greece, for the whole family. Hi, apologies.. life ate up a lot of time lately. Just seeing this. Karma applies to all vehicles. It is not even philosophy specific. 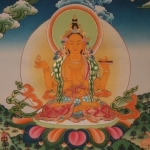 It is a principle which encompasses all vehicles and beings that stumbled into Samsara. It's nicely thought out thank you for taking the time to write. I may go on and on in my posts... I guarantee I'm not a terribly lengthy thinker off the boards, I just have general existential angst I'm working out overall, as I find myself in that awkward phase between birth and death. I had a wonderful retreat recently which opened my eyes a great deal, and I have a strong confidence in the method of Dharma. I study all aspects of buddhadharma but due to karmic conditions and previous aspirations, I really resonate most with the Dzogchen vehicle. Verifying karma is a fundamental part of understanding the true nature of your actual condition, I don't think it's an ego game. To see the true nature of your mind there's a lot of layers to get thru... I mean we are caked in conditioning that prevents us from really integrating our own true nature, so much of this is a very useful exercise. The question mostly pertained to finding markers and knowing that you are going the right way (for you). We think a lot of things. That doesn't mean we see or understand what the conditions are which are producing that thinking/feeling and acting. I have now learned how to verify that and apply it. All of a sudden... Karmic conditions are maturing rather quickly manifesting in the form of obstacles and changes which I sometimes can mitigate somewhat thru the effect of secondary causes generated by the protection of practice. The rest I deal with as I can. I've also had that question pop up in some situations and I've come to think that maybe not even a personal thing between you and your brother... More like a series of conditions you both had accumulated at some point that now matured this way, you with having a kind of load to carry that is debt related, and he to leaving your family in this specific secanrio.. and now you're where this karma will run its course... The trick is to either just exhaust that karma trying to have better clarity of the nature of these relative (but very annoyingly felt) consequences, and to not generate new karma in body speech and mind. Of course it's much easier said than done... But I have been taking to welcoming exhausting karma as needed, and I've started to become sensitive to how every action and thought produces it's own kind of karma. Many good hugs and vibes to you. How do you know you're not just making things worse thinking you're making things better (good intentions and all that jazz)??? The solution is always to practice what you've been given until your mind becomes clear, meaning unhelpful states of mind have subsided & you can act based on wisdom. If you're unsure, practice more. If practicing doesn't seem like enough, you have two options... one is to accumulate more karma and wait for it to burn itself out through your experiences, and the other is to practice anyway. Mechanically they are identical, but functionally they are opposed. Blindly creating karma through mundane activity is the risky one. Practice necessarily protects you from that, always, every single time, because it's not connected to your ordinary mind, but to your wisdom mind, which is the very mind of the Buddha. More to the point, in which direction is your fear (i.e., of worsening karma) pushing you? Is it constructive or not? How much time do you spend with this fear by itself, vs. letting it spur you to action? The state of your mind, which is capable of indulging the fear in unproductive/harmful ways, is what creates the karma producing the fear you mean to escape. If the fear is there and you can't get rid of it at this time (because you can't change the conditions causing it to arise), employ practice. Let go of the mind that judges & tries to ascertain what will happen, because this is based on the Eight Worldly Attitudes; seize the mind that is committed to making your life meaningful through practice. It already exists within you, ready to be activated through conscious contemplation. Remember that the practice you've done in the past & that you choose to do currently is helping you right now, as opposed to in the future.